I must regretfully confess that for years I’ve been nagging my horses. I give an aid and then I keep giving it, thinking that if I stop telling them to trot, half pass, or canter, the horse will stop moving. So I train my horses to expect continual reactivation again and again, and guess what? My trainers over the years have tried to help me with this, reminding me not to nag the horse, to give an aid and expect a response, to keep my aids light, etc., and I’ve gotten much better, but I still have a tendency to cling with my lower leg – I put the leg on and I forget to take the aid off. See this picture below? Clinging with the calf, pressing, pressing…and bracing with the back. Poor Finn. 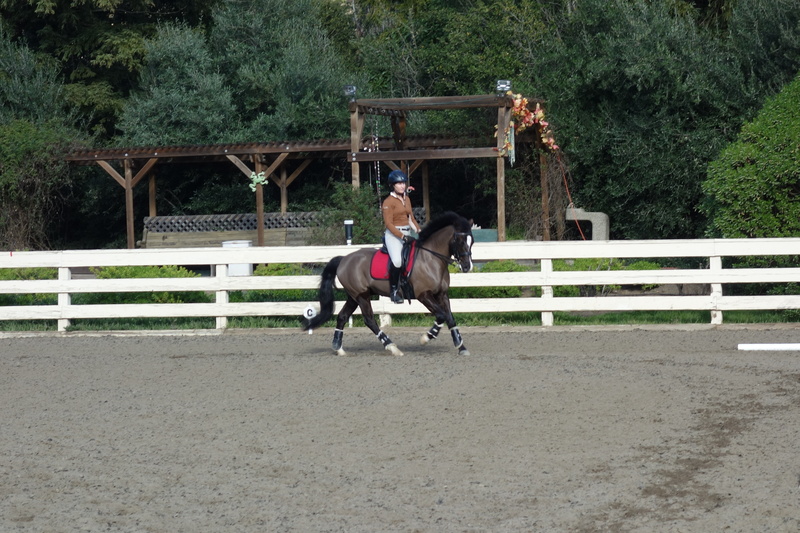 At the recent Corine Dorrepaal clinic, from the first moment we worked on this problem for THREE days, and for the first time, I really felt the difference in my horse and in myself when I gave an aid quickly and then let go. Wow! My horse had a chance to respond and then be free! He was so much less braced in his body, because he didn’t have me clinging to him with my legs. Instead, my legs were draping along his sides lightly. I could sit more deeply with a long, relaxed leg. 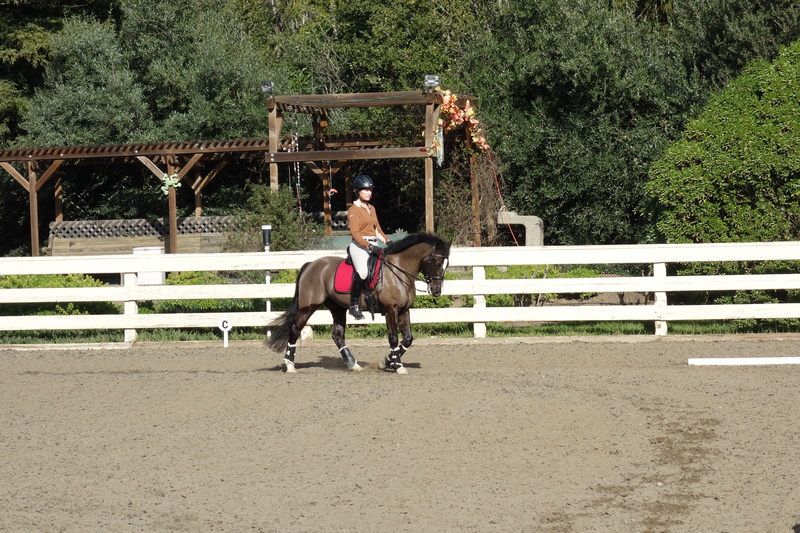 Corine considers riding a conversation with your horse. 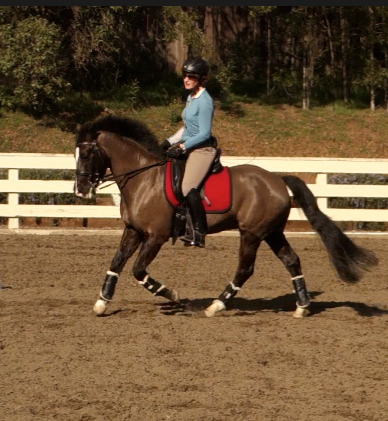 When the rider uses the leg all the time, she is doing all the talking and can’t hear what the horse is saying. If she relaxes the leg, then she can receive information back from the horse through her softly draped leg and through her seat. Information such as Is the horse bending softly? Is there tension is his body? How is his back feeling? Is he responding quickly and softly to my aids? all becomes so much more clear when the legs are not getting in the way by gripping. 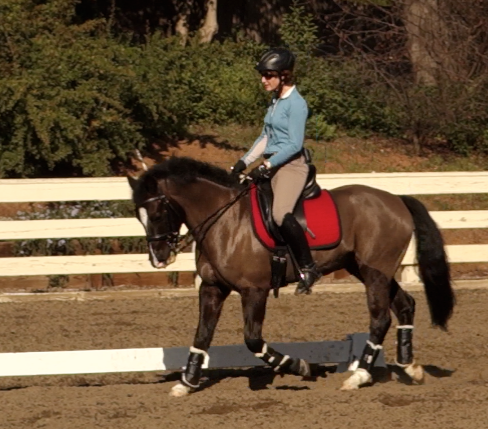 For my next stage of horse education, there is nothing more important I can work on than to learn to converse with my horse through riding with a more relaxed seat and leg. I wish I would have understood this decades ago when other trainers tried to teach me (and they did try), but I guess when the student is ready, the master appears. Now is the time! Fortunately, my trainer is ready, willing, and able to move forward and will be so happy that I finally have a glimmer of understanding in this area. My time with Corinne illustrates the benefit of going to a clinic, however. Sometimes going outside your comfort zone and hearing the same truths spoken differently by someone else with different illustrations finally gets it through your thick head. “Transitions, transitions, transitions are the name of the game,” Clarke said, explaining he wanted the horse to give an electric reaction to Morris’ aids in the walk/trot transitions. Well, clinging calf or not, I think you both look lovely! Well done!